I am moving from Los Angeles to New York for a few months starting in February. Even though the 60-degree temperature difference is already giving me the chills, I am very ready for the energy of The City. I need to know the best restaurants to go as a single and fabulous woman new to NYC. I really enjoy sitting at a good bar to dine so that I don't look too obvious but have no problem asking for my own table and ordering a full bottle of wine just for me. Do you have suggestions of places that are delicious, unique and welcome the woman who loves to eat with or with out a man? Gotham Bar and Grill, the new, tough to crash John Dory, even Tom Valenti’s wildly popular West Branch, welcome singles at the bar. At West Branch I love the burger and the pressed Cuban sandwich. Behind John Dory’s partners is the eating bar. Daniel’s Bar Boulud across from Lincoln Center serves at the counter and has a tasting table for singles as well. The charcuterie, more than anything else, will make you feel you’re in Paris. Next door Fiorello seats singles overlooking the antipasti display. I point to what I want; it’s my longtime favorite after-the-movie supper. At Picholine, chef Terrance Brennen’s splendid small tastes – he’s gone gaga for Spain – are available in the bar-lounge but you can also order dinner there. On weeknights after the theater crowd leaves at 8, almost any of these restaurants would probably welcome a single. The communal table at Asia de Cuba in Morgan's Hotel is still a spot to meet people while eating well (though portions are meant to share)… perhaps you can charm the waiter into a half portion or two. 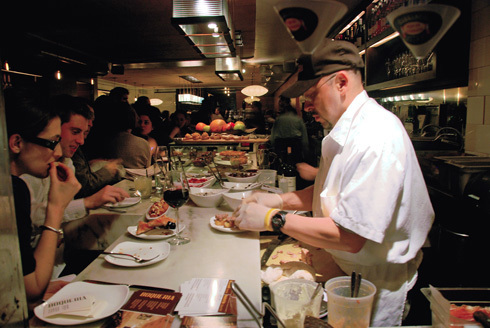 Wine bars (Bar Jamón or Terroir, the hangout next to Hearth) and tapas bars (I love Boqueria in the Flatiron area and newly cloned in Soho) encourage chat and flirt. Click here to read about my tapas crawl. La Fonda Del Sol on Vanderbilt Avenue in the Met Life Building is the newest tapas deal in town… should be hot. It’s not easy to score seats at the single long wooden slab at Soccarat Paella Bar in Chelsea but it would be easiest for a single. Soccarat refers to the crispy rice that sticks to the bottom of the pan – a delicious specialty here. New York is a city of singles trying to be twos and given the pain of layoffs and recession cutting down early birds and late diners, most restaurants will be glad to see you. Steak Houses are where men hang out. Try for a bar stool at Strip House. At Michael Jordan’s in Grand Central they offer a fat new burger at the bar but the easiest men to meet are likely to be married commuters. Buyer, beware.